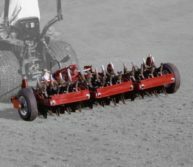 The 686 and 687 Turf Aerators are an effective and efficient way to aerate your large turf areas. Designed with 32 kg cast wheels and a unique floating head design, these aerators give excellent depth performance and follow ground contours, vertically and horizontally, like no other aerator available. For highly compacted or unusually uneven grounds, optional rear weights are available for either model. Easy access to components make it easy to maintain and repair. 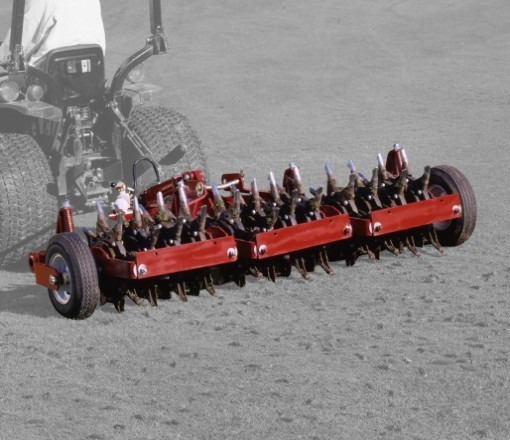 Multiple tine options let you tailor your aerator to specific greens.